Heat oven to 325°F. Place ungreased 1 1/2-quart ceramic casserole in 13x9-inch pan. In 2-quart saucepan, heat whipping cream and liqueur over medium-low heat just until hot; DO NOT BOIL. Set aside. In medium bowl, stir eggs, egg yolks and granulated sugar with spoon until well blended. Gradually add hot cream mixture to egg mixture, stirring constantly. Strain mixture through fine strainer into casserole. Place pan with casserole in oven; pour hot water into pan until halfway up side of casserole. Bake 25 to 30 minutes or until mixture is set when casserole is jiggled. Remove from oven. Remove casserole from pan of water; place on wire rack. Cool 30 minutes. Cover casserole with lid or plastic wrap, not allowing wrap to touch surface of custard; refrigerate at least 8 hours or overnight. Set oven control to broil. With paper towel, carefully blot any surface liquid from top of custard. Spoon brown sugar into fine strainer. With fingers or back of spoon, press brown sugar through strainer evenly over top of custard. Broil 6 to 8 inches from heat 30 to 60 seconds, rotating or moving dish if sugar is melting unevenly, until brown sugar is melted and bubbly (watch carefully, as topping burns easily). Cool 2 minutes to harden sugar. Serve immediately. 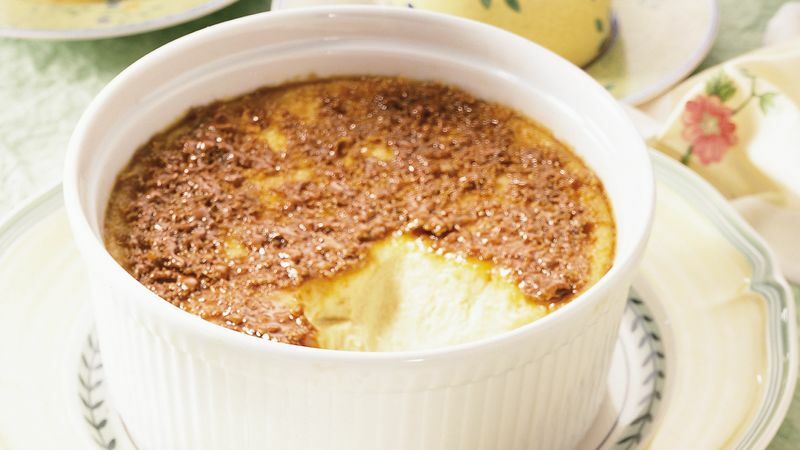 Be sure to use a ceramic casserole, not a glass one, when preparing this restaurant-inspired dessert. Broil the sugar topping just before serving the crème brûlée so the moisture from the custard does not soften the crisp topping.